The Seneca Regional Chamber of Commerce and Visitor Services will hold a cybersecurity program in the Community Room at 19 W. Market St., Suite B on Wednesday, January 23 at 7:30 a.m.
How much is your business dependent on the Internet? Are you satisfied with your online safety posture? Who do you trust for the security of your online services? Do you know what to do when a security incident or breach hits your business? Do you have a plan? You don’t process sensitive government data or have valuable trade secrets, but you still have flow of cash to run your business. Do you know that cyber criminals are after it? Join us to learn about basics of cybersecurity practices for small business owners and managers. Importance of cybersecurity for small business, basic protection measures, resources and tools for small businesses, sample tool for assessment of cyber risk score. Tiffin University’s Ali I. Yurekli, PhD, CISSP, Assistant Professor of Cybersecurity, School of Criminal Justice & Social Sciences will be the speaker for the morning. This program is free and business owners are encouraged to attend. Please RSVP by January 17th. Send an e-mail to Deb at dmartorana@tiffinchamber.com or call 419-447-4141 or online: tiffinchamber.com/calendar/2019/01/23/cybersecurity-program. Bill Auxter, Director of the Ohio Small Business Development Center at Terra State Community College, hosts a free, monthly Small Business Basics seminar at the Seneca Regional Chamber of Commerce and Visitor Services. On average, Bill works with more than 150 small businesses each year, which includes pre-ventures, start-ups, and existing businesses. The Business Basics seminar is a two-hour session designed to answer questions about starting, buying or expanding a small business. Participants are walked through the basics of name registration, licensing, taxes, advisors, business entities, employees, insurance, financing, business planning and more. To register, contact Bill Auxter at 419.559.2210 or bauxter@terra.edu. Click here for more general information. As the 8th season of the Seneca County Farmers’ Market begins, a new shop local option has been added: the Court Street Collection. In addition to the traditional market vendors along S. Washington St., Court St. will be closed off between Washington St. and the alley to accommodate any business interested in setting up a pop-up shop (as space allows) in this non-traditional market. This season also includes a bonus October date. For all dates, the market begins at 9 am and concludes at 1 pm, rain or shine. Vendor set-up begins at 8 am. The market is located on South Washington Street between East Perry Street and East Market Street. A variety of products will be available, including baked goods, fresh produce, plants and flowers, and more. Live entertainment, demonstrations and children’s activities are also being planned. New this year in conjunction with the farmers’ markets is the Court Street Collection. A non-traditional market on Court Street from Washington Street to the alley, any business is welcome to have a pop-up shop, but space is limited. The Seneca County Farmers’ Market in Downtown Tiffin is sponsored by the Seneca Regional Chamber of Commerce and Visitor Services. Vendors interested in participating are encouraged to call 419-447-4141 for additional information. 12 p.m. – 2 p.m.: Simply Susan’s, 70 S. Washington St.
5:30 p.m. – 7:30 p.m.: Melissa Perry Photography, 70 E. Market St.
10 a.m. – 1 p.m.: Santa & His Reindeer at Westgate Village, Pat Catan’s, 646 W. Market St.
12 p.m. – 2 p.m.: Bailiwicks Coffee Company, 62 S. Washington St.
5:30 p.m. – 7:30 p.m.: Bailiwicks Coffee Company, 62 S. Washington St.
12 p.m. – 2 p.m.: Tom Rodgers Flowers, 245 S. Washington St.
12 p.m. — 4 p.m.: Lowe’s, 1025 W. Market St.
12 p.m.-2 p.m.: The Ritz Theatre, 30 S. Washington St.
5:30 p.m.-7:30 p.m.: Frozone, 114 S. Washington St.
12 p.m.-2 p.m.: Jolly’s, 66 E. Market St.
Ready to pick out a tree or fresh wreath? Saturdays and Sundays Riehm farm will be open, with the fields still producing veggies and homemade cookies! Keep an eye out for Santa, as he stops by most weekends. Still trying to get into the holiday spirit? No worries! There many events to chose from in Tiffin and Seneca County that are sure to put you in a holly-jolly mood. 5:15 p.m.: Christmas Tree Lighting, southwest corner of Monroe & S. Washington Streets. Reading of “’Twas the Night Before Christmas”, music by the Heidelberg Singing Collegians, and hot chocolate served by the Elks! 7 p.m.: Tiffin University “Christmas at the Ritz”, Ritz Theatre, 30 S. Washington St.
10 a.m.-3 p.m.: Tiffin Art Guild Holiday Art Boutique, 130 S. Washington St.
10 a.m.-4:30 p.m.: Granny Ballreich’s Christmas Open House, 186 Ohio Ave.
10 a.m.-5 p.m.: Owltique Nail Spa Christmas Open House 145 Madison St. After the parade, Girls 11 & under may get their nails done. Boys will have a project to make. 11 a.m.—1 p.m.: Tiffin Art Guild Make & Takes, 130 S. Washington St.
11:30 a.m.—1 p.m.: Blossoms & Butterflies Garden Club – Make & Takes, Laird Arcade. Children will make bird feeders. 11:30 a.m.—2 p.m.: Seneca County Park District—Make & Takes, Laird Arcade. 12 p.m.—4 p.m. Seneca County Museum Christmas Open House, 28 Clay St.
12 p.m.—4 p.m.: Seneca County Museum Christmas Open House, 28 Clay St.
12 p.m.-4:30 p.m.: Granny Ballreich’s Christmas Open House, 186 Ohio Ave.
1 p.m.-3 p.m.: Operation Elf: A Community Christmas Party, Tiffin-Seneca Public Library, 77 Jefferson St.
1 p.m.-5 p.m.: Tiffin Historic Trust Holiday House Tour Tickets in advance: Tiffin Ace Hardware, 1550 W. Market St. On Dec. 3, tickets are available at the Grammes-Brown House, 172 Jefferson St. $10. 3 p.m.: “A Heidelberg Christmas Carol”, The Ritz Theatre, 30 S. Washington St.
6:30 p.m.-8 p.m.: St. Francis Live Nativity, 200 St. Francis Ave.
6:30 p.m.: Tiffin Historic Trust Chili Supper, Grammes-Brown House, 172 Jefferson St. RSVP to J. Fletcher at 419-585-2075 or 419-618-9728. 4 p.m.: Christmas Lessons & Carols, Old Trinity Episcopal Church, 125 E. Market St. Enjoy Christmas music and refreshments. 7:30 p.m.: The Nutcracker, The Ritz Theatre, 30 S. Washington St.
1 p.m.—3 p.m.: Franciscan Earth Literacy Center Open House, 194 St. Francis Ave. Meet Santa, Mrs. Claus and the new animals living at the FELC. 5 p.m.—8 p.m.: Seneca County Museum Christmas Open House, 28 Clay St.
7:30 p.m.: Frankie Avalon’s Beach Blanket Christmas, The Ritz Theatre, 30 S. Washington St.
1 p.m.: “A Christmas Story” Ritz Theatre, 30 S. Washington St.
7:30 p.m.: Allen Eiry Center Christmas Show with “The Late Show”, 28 Hopewell Ave.
Tuesdays & Thursdays 5 p.m. – 7 p.m.; Saturdays noon – 2 p.m. 11th Annual Santa at the Depot, LE&W Depot, 128 W. North St.
7 p.m.-10 p.m. — 3rd Annual Santa’s Wine & Cheese Tasting Event at LE&W Depot, 128 W. North St.
10 a.m.-3 p.m. — Holiday Extravaganza at Geary Family YMC, 154 W. Center St.
7 p.m.-10 p.m. — 3rd Annual Santa’s Wine & Cheese Tasting Event Tasting Event at LE&W Depot, 128 W. North St.
And for those who have a competitive spirit, check out these fun community contest and cast your vote! Deadline: Friday, January 12, 2018! Write a happy Christmas memory and the winner will read their story at the 2018 Christmas Tree Lighting Ceremony! 4 pages handwritten or 2 pages typed. Age appropriate grammar is expected. Entries from students K through 12. Adults can submit in a new category! Participants must live in Seneca County or the event must take place in Seneca County. Entries may be dropped off at the Tiffin-Seneca Public Library or the Chamber office during regular office hours. Parents/Guardians will have to sign a waiver when the essay is submitted. Visit TiffinChamber.com for more information! Croghan Colonial Bank 48 E. Market St. & 796 W. Market St.
Fifth Third Bank 513 W. Market St.
Impact Credit Union 435 W. Market St.
Old Fort Banking Company 33 E. Market St. & 634 W. Market St.
PNC Bank 550 W. Market St.
Superior Credit Union 203 N. Sandusky St.
Tiffin-Seneca Public Library 77 Jefferson St. US Bank 730 W. Market St.
Click here for a full brochure of the events listed above. 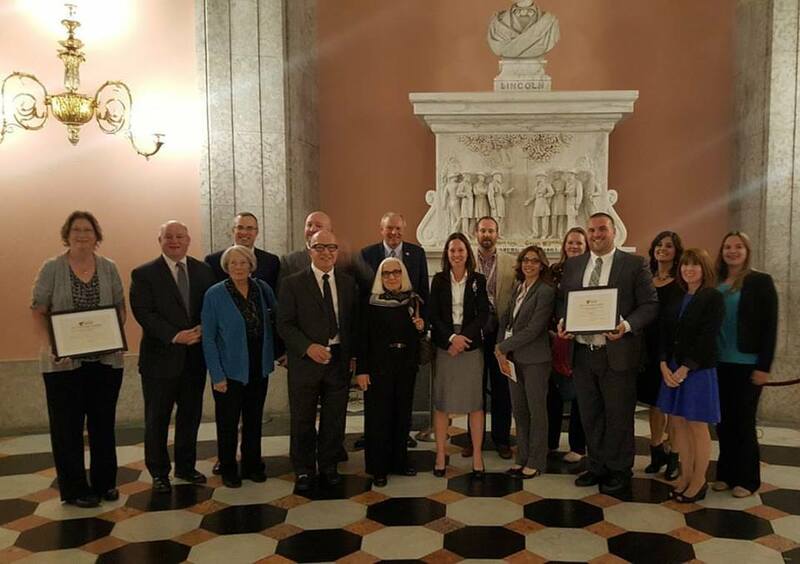 TIFFIN, OHIO – October 18, 2017 – The Seneca Industrial and Economic Development Corporation (SIEDC) Downtown Marketing Committee and the Seneca Regional Chamber of Commerce and Visitor Services received the Heritage Ohio Award for “Best Main Street Committee Event” for the annual Around the Town event in a ceremony at the Ohio Statehouse October 17. Around the Town is an annual event introducing incoming Heidelberg and Tiffin University students to businesses and organizations in the community. For 20 years, the event was held on the colleges’ respective campuses. In 2015, the Chamber partnered with the Downtown Marketing Committee through SIEDC and event was brought to a central location downtown, bringing both schools together and highlighting the proximity of downtown to the students. Tiffin officially became a Heritage Ohio Main Street community in 2016, after two years of affiliate membership. The Ohio Main Street Program works with communities across the state to revitalize their historic or traditional commercial areas. The program works on a four-point approach emphasizing, organization, design, promotions and marketing, and economic development in downtown revitalization. Heritage Ohio is the statewide, not-for-profit preservation organization, dedicated to encouraging and assisting people and organizations to protect, preserve and revitalize Ohio’s heritage. Formed in 1989, is the coordinating agency for the Ohio Main Street Program. In 2002, Heritage Ohio was designated as the statewide partner of the National Trust for Historic Preservation. Heritage Ohio mission is to help people: save the places that matter, building community, and live better. Learn more at www.heritageohio.org. Many communities, organizations and individuals submitted nominations for consideration. The awards recognize the numerous preservation and revitalization accomplishments of people, businesses, and organizations across the state. The Selection Committee reported an increased level of quality in nominations, awarding 16 categories at this year’s event. Employees who work for organizations or companies that are members of the Seneca Regional Chamber of Commerce & Visitor Services or Seneca Industrial & Economic Development Corp. soon will have an incentive to pursue higher education in Tiffin. Tiffin University and Heidelberg University are partnering to offer a tuition discount of up to $200 for graduate and undergraduate coursework for students who are employees of Chamber or SIEDC members. The employees would be required to meet the academic requirements, be accepted for admission at Heidelberg or Tiffin University, and enroll in courses, according to a joint statement by Jeremy Marinis, vice president for Enrollment Management and Student Affairs at TU, and Doug Kellar, vice president for Enrollment Management at Heidelberg. At Heidelberg, a $200 per-credit-hour discount can be applied to all undergraduate degree programs and Master of Business Administration degree courses. Tiffin University is offering a $200 per-credit-hour discount for Tiffin campus undergrad programs and a $100 per-credit-hour discount for graduate degree programs, online and off-campus bachelor’s degree programs. The tuition discount will remain in place until students graduate, transfer or withdraw. The agreement takes effect in May. The tuition discount partnership is another in a growing number of ways Heidelberg and Tiffin University are partnering together to elevate both institutions and the community. HU and TU come together every August for the Around the Town event to introduce new students to local businesses and organizations they will encounter during their time in Tiffin. The schools have partnered on job fairs, international events and community service projects, most recently joining efforts to collect food for the Salvation Army in recognition of Martin Luther King Jr. Day. The partnership was announced during SIEDC’s annual meeting Thursday (March 23). Additional information about eligibility and other requirements is available on the Tiffin University website at www.tiffin.edu/local-benefit or the Heidelberg website at www.heidelberg.edu/community-discount. The Seneca Regional Chamber of Commerce and Visitor Services offers a wide variety of programming open to businesses and professionals alike, including networking and educational organizations. Two of those groups are the Industrial Management Council and the Safety Council. According to the Chamber website, the Industrial Management Council (IMC) exists to influence community and political organizations on items of industrial interest, assist members in attaining improved efficiency and more effective business methods, work as a group in order to contain industry related costs, promote industrial development, support educational programs which encourage free enterprise, and ameliorate relationships and develop better understanding between industry and other facets of the community. The group meets monthly to hear speakers on industry-related topics and network. There are currently more than 60 members. The Tiffin Safety Council is an organization focusing on safety in the workplace and is open to all businesses. The group meets regularly to listen to guest speakers and network. The council currently has about 100 members, and anyone is welcome to join. The Bureau of Workers’ Compensation offers resources to help employers improve health and safety, including the Safety Intervention Grant Program – which awarded more than $15 million to 570 employers for the purchase of safety improving equipment last year – as well as programs for employers starting wellness and drug-free workplace programs. These programs help keep Ohio’s workplace injury statistics below the national average. The Seneca Regional Chamber of Commerce and Visitor Services and the Seneca Industrial and Economic Development Corporation have partnered to produce the city’s first-ever visitor’s map. The map directs visitors to restaurants, attractions, entertainment and lodgings, and retail locations – all things a person from outside the town may be looking for. One side of the map encompasses the entire city of Tiffin, with the other side focused on downtown. SIEDC Downtown Main Street Manager Amy Reinhart said the map was one of the goals set forth in the 2010 Downtown Strategic Plan and furthers the marketing mission of the Main Street downtown revitalization approach. “We have taken many steps this year to make it easier for visitors, students and residents to find their way downtown, and to promote local businesses. This is a great addition to the Discover Tiffin phone app, the new kiosks in front of the Joint Justice Center and on the university campuses, wayfinding signs at downtown intersections, and new parking signage for downtown lots,” she said. The maps can be found at the Chamber (19 W. Market St., Ste C), and in several businesses. For a downloadable pdf, click here. Please come help the Seneca Regional Chamber of Commerce and Visitor Services Ambassadors welcome the newest addition to Tiffin, Slate Real Estate. A Ribbon Cutting Ceremony for the new office will be held this Friday, April 8 at 4:45 PM, at 1660 W. Market St. Ste. C.
Britny is an Owner & Manager of Slate Real Estate LLC . Britny is a Tiffin native and a Tiffin University graduate with a Bachelors Degree in Psychology and Addictions Counseling. Britny is a member of the National Association of Realtors, the Ohio Association of Realtors, and the Firelands Board of Realtors MLS. Britny prides herself on providing her clients with excellent assistance every time through every step of their real estate transactions. In her spare time, Britny enjoys actively volunteering her time to her community and spending time with her son Jaxon and husband, Todd. Marcia is also an Owner & Manager of Slate Real Estate. An Ohio State grad, after 30 years of teaching and coaching in the Tiffin City Schools she decided to not retire but start a staging business with her sister Sheila called STAGEPLUS, and then began a real estate career with her daughter-in-law Britny. In January of 2016 they opened Slate Real Estate LLC. She lives in Tiffin with her husband Rich and is enjoying being a Grandma to Jaxon and Sebastian. Sara is a Broker/Owner of Slate Real Estate. She was licensed in 1978,and managed an office for 15 years before becoming a Broker/Owner for Coldwell Banker, Hohman Wingart Realtors and later Colwell Banker Tri-Pro Realty. She was on the Firelands Board of Directors for over 15 years, serves on the Professional Standards, Legislative Forums and was the ChairPerson for the Property Management Forum for 2012, at the state level for the Ohio Association of Realtors. She is also Past President of the Firelands Association of Realtors, Community Hospice Care, and Bascom Long Distance Board of Directors. She and her husband Don have two sons, Scott of Tiffin, and Brett of Columbus area, and two grandchildren, Noah and Zora. Slate Real Estate is a member of the Firelands Association of REALTORS, a professional trade association of over 500 licensed real estate agents that provides its members with resources and training to enhance the services they provide their clients. For more information, please contact the office: (567)207-2100.